Man it's been a long time since I've hit the Des Plaines with a set of waders!! For whatever reason, I had the urge to suit up and see how the smallmouth were doing and I was not disappointed. Time was short but I had some goals I wanted to make happen including some good video and some product testing. Most importantly, I wanted to catch a few fish!! After I was done, I felt great because everything had gone exactly how I thought. It's been a while since I have been able to pull that off in terms of fishing. My first fish came on a white swim jig with a chartreuse Fishing Physics Grub in their minnow soak. The fish came right off the slow side of a seam and hit hard. I was extremely happy to see a 16" smallmouth at the end of the line. I took a few pictures and then a release video. After I released her, I moved down stream a bit as the sun was going down pretty fast and I had a certain spot I wanted to be in for my quest of a few topwater smallies. As I walked downstream, it dawned on me that my camera might still be set up on timelapse mode for a different video project. Sure enough it was - which meant I didn't get my release shot. Oh well. As I approached my target area, I could see the smallies starting to pop the surface so I quickly tied on the Biovex Joint Bait 110 and started casting. I only had another half hour to make it back to the truck before the gates to the access spot were closed so I got back to casting. A few minutes later, I made a cast just past a shallow ridge in the middle of the river and started bringing it over to the deeper channel when I got slammed! The fish tail walked a couple of times and I was trying to reel as fast as I could to get pressure on the fish and keep it low in the water. I really didn't think it was a very big fish at first but once I got it closer, it finally started pulling pretty hard. 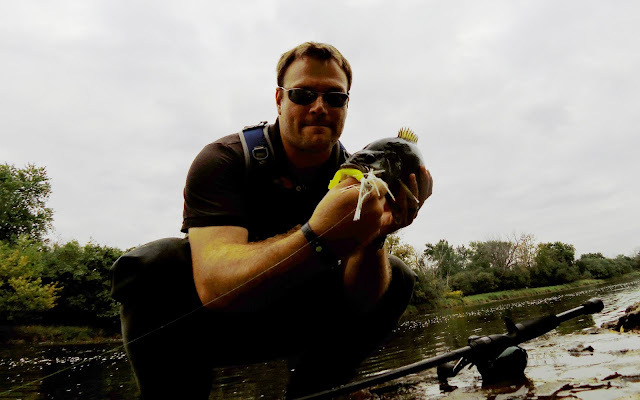 I was using my Phenix X-10 Crankbait rod that FSA Customs had built for me earlier this year and I love how soft the tip is while having a really nice backbone to control a fish. In the video below, you can see exactly where that backbone comes in! 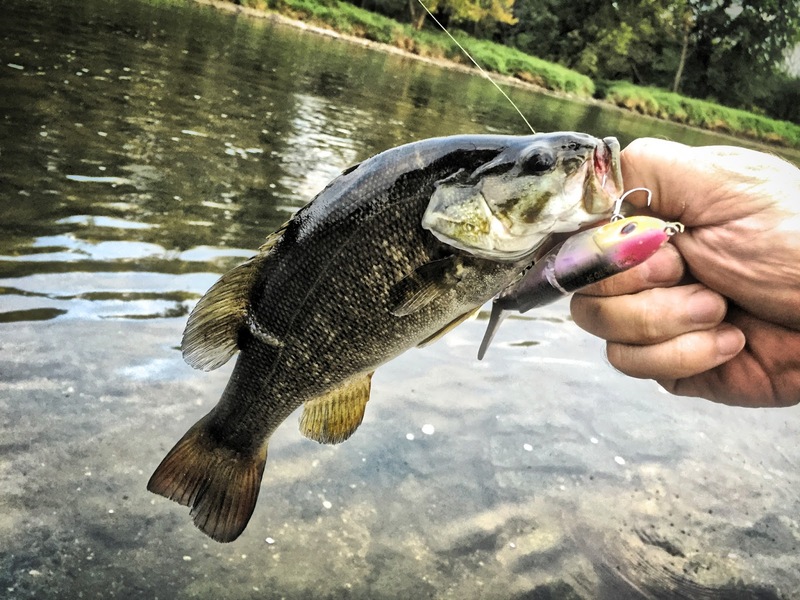 I got the fish landed and while it certainly wasn't the biggest smallie I've caught, it was a great 15" river fish with a ton of power. These fish really never stop fighting - they are warriors. After I got that fish released, I checked the time and had to start making my way back to the truck. I was walking and casting at any spot that looked like it might hold a fish or two when I saw a nice boulder in a couple feet of water. It was smack dab in the middle of some strong current with a nice little slack water spot right behind it and sure enough, I pulled one right out of there. Sure he was the smallest of the day but made for a nice end to the evening. As, I started going through the footage, I realized that everything didn't turn out as I had hoped and I am a bit bummed about that. Apparently, the mic was turned off so none of my audio came out!! I had a ton of footage that I wanted to send to Fishing Physics, Biovex, and BugBam explaining the products and reviews. Unfortunately, all I have is muted video. With that said, we can see that the Biovex and Fishing Physics stuff worked great!! What you can't see/hear is the BugBam review. If you look at my right wrist, you will see a black band - that is the BugBam mosquito repellent band. I'll post a full review on it in the near future but the short version is that I was extremely happy at how well it kept the blood suckers off of me! Hey Nick, it's so nice to see you joining the pedestrians out on the water. Nice going on the vid. I really miss that river. Nice vid of Bronzeback! I use to fly fish the Des Plaines River in Lemont several years ago and catch a lot of Smallies and Pike. It's time to revisit this river again. I too grew up in Brookfield, IL and fished everywhere I could.